Maggie Stiefvater is an artist, musician, and writer. She lives in Virginia with her husband, two kids, neurotic dogs and an insane cat. She’s an avid reader, an award-winning colored pencil artist, and she plays several musical instruments, including the Celtic harp, the piano, and the bagpipes. Learn more at Maggie Stiefvater’s website and be sure to check out Kelly’s interview with Ms Stiefvater. 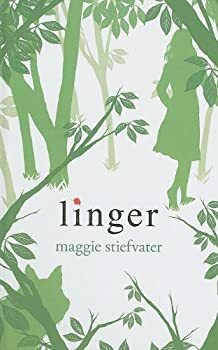 CLICK HERE FOR MORE BOOKS BY MAGGIE STIEFVATER. Kelly interviewed Maggie Stiefvater about her Young Adult fantasy novel Lament: The Faerie Queen's Deception. Be sure to also read Kelly's review of Lament. Learn more about Ms Stiefvater at her website. Lament hearkens back to the old faerie legends, which were often tragic and often frightening, and not at all sugar-coated. How did you become interested in faerie lore, especially the darker stuff? The Books of Faerie — (2008-2009) Young adult. Publisher: Sixteen-year-old Deirdre Monaghan is a painfully shy but prodigiously gifted musician. She’s about to find out she’s also a cloverhand — one who can see faeries. Deirdre finds herself infatuated with a mysterious boy who enters her ordinary suburban life, seemingly out of thin air. Trouble is, the enigmatic and gorgeous Luke turns out to be a gallowglass — a soulless faerie assassin. An equally hunky — and equally dangerous — dark faerie soldier named Aodhan is also stalking Deirdre. Sworn enemies, Luke and Aodhan each have a deadly assignment from the Faerie Queen. 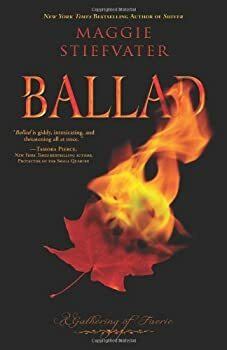 Namely, kill Deirdre before her music captures the attention of the Fae and threatens the Queen’s sovereignty. Caught in the crossfire with Deirdre is James, her wisecracking but loyal best friend. 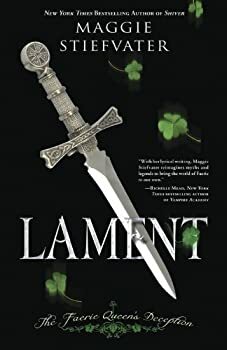 Deirdre had been wishing her life weren’t so dull, but getting trapped in the middle of a centuries-old faerie war isn’t exactly what she had in mind… Lament is a dark faerie fantasy that features authentic Celtic faerie lore, plus cover art and interior illustrations by acclaimed faerie artist Julia Jeffrey. First love: it's scary and confusing enough even when there aren't homicidal faeries involved. Add in the homicidal faeries, and a girl can get in over her head before she can say "cold iron." Maggie Stiefvater's Lament: The Faerie Queen's Deception is an excellent YA fantasy that will appeal to anyone who likes stories of the fae as they appear in the oldest legends: dangerous, seductive, and sometimes deadly. Let me say right up front: Lament is downright frightening in places. These are not your fluffy, sparkly faeries. Getting mixed up with them can mean stark terror and heartbreaking choices. James' eyes glittered in the darkness. "Which is the right one?" "The one that hurts," Cernunnos said. No one walked away unscathed from the events of Lament: The Faerie Queen's Deception. James bears physical scars, along with a persistent torch for Deirdre, who only sees him as a friend. Dee, meanwhile, is pining for Luke and spiraling into depression. James and Dee think the faerie folk are through with them, but when they begin classes at Thornking-Ash, a residential fine-arts high school, trouble follows them there. The Wolves of Mercy Falls — (2009-2014) Young adult. Publisher: For years, Grace has watched the wolves in the woods behind her house. One yellow-eyed wolf — her wolf — is a chilling presence she can’t seem to live without. Meanwhile, Sam has lived two lives: In winter, the frozen woods, the protection of the pack, and the silent company of a fearless girl. In summer, a few precious months of being human… until the cold makes him shift back again. Now, Grace meets a yellow-eyed boy whose familiarity takes her breath away. It’s her wolf. It has to be. But as winter nears, Sam must fight to stay human — or risk losing himself, and Grace, forever. Warning: This review will contain spoilers for the previous book, Shiver. There's simply no good way to discuss Linger without them. You could stop with Shiver. You really could. It ends on a tentative note of happiness, and it's easy to imagine that everything worked out OK after that. Sure, there are a few loose ends: Isabel's dad is still itching to shoot some wolves, the lycanthropy cure is incredibly dangerous and might have unintended consequences, and Grace and Sam have developed a relationship that they're still considered too young to have. But you could turn the last page of Shiver and be satisfied, and hopeful for Grace and Sam's future. The Raven Cycle — (2012-2015) Publisher: “There are only two reasons a non-seer would see a spirit on St. Mark’s Eve,” Neeve said. “Either you’re his true love… or you killed him.” It is freezing in the churchyard, even before the dead arrive. Every year, Blue Sargent stands next to her clairvoyant mother as the soon-to-be dead walk past. Blue herself never sees them-not until this year, when a boy emerges from the dark and speaks directly to her. His name is Gansey, and Blue soon discovers that he is a rich student at Aglionby, the local private school. Blue has a policy of staying away from Aglionby boys. Known as Raven Boys, they can only mean trouble. But Blue is drawn to Gansey, in a way she can’t entirely explain. He has it all – family money, good looks, devoted friends – but he’s looking for much more than that. He is on a quest that has encompassed three other Raven Boys: Adam, the scholarship student who resents all the privilege around him; Ronan, the fierce soul who ranges from anger to despair; and Noah, the taciturn watcher of the four, who notices many things but says very little. For as long as she can remember, Blue has been warned that she will cause her true love to die. She never thought this would be a problem. But now, as her life becomes caught up in the strange and sinister world of the Raven Boys, she’s not so sure anymore. 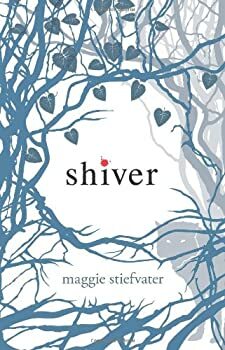 From Maggie Stiefvater, the bestselling and acclaimed author of the Shiver trilogy and The Scorpio Races, comes a spellbinding new series where the inevitability of death and the nature of love lead us to a place we’ve never been before. Blue is the only non-psychic in a large extended family of psychics in Henrietta, Virginia. Her only unusual ability is that her presence amplifies the psychic powers of others around her, but she herself cannot use these abilities. So it’s a shock when, while sitting vigil in a graveyard with her aunt Neeve, Blue sees the spirit of a boy about her age who is destined to die in the next year. She learns that there are only two possible reasons she was able to see him: either he’s her true love, or she’s going to kill him.